So not too long ago you might remember that I blogged about making my bedroom a bit lighter for the spring/summer. I use red everywhere in my house which makes decorating for the summer months harder to do. Well, while at Gabriel Brothers I saw a package of two of these beauties below for $4!!! I heart quilts. Especially beautiful pottery-barn-rip-off ones. I realize that the colors aren’t exactly summery, but I loved the blue and this pattern screams Beth. I frantically searched the store to see if maybe by chance they had a quilt to go with these lovelies but no such luck. I couldn’t pass up a $2 sham though so I gave them a home. I have seen these pillows highlighted on several decorating blogs and it gave me an idea. Why not buy some white $.30 felt and some fabric glue and make my own birdy pillow? So that is exactly what I did. I used the above picture as a template. Drew my own on felt, cut it out and glued it on my sham. So cute! Here they both are looking springy and stylish. And below are all of my birdy Pier 1 plates that I’m trying to figure out how to incorporate into my bedroom. This is where you come in. I still have that big empty space above my bed and those are 9 foot ceilings. Should I place all of the plates above my bed, or is that too much bird? What about just two above the night stand? Don’t use them at all? Help me out here people. I have no idea, and I think you are insane… but in a really impressive way. Stop making me feel inadequate as a decorator, okay? YOu could use a plate on either side of the window by the drapes. 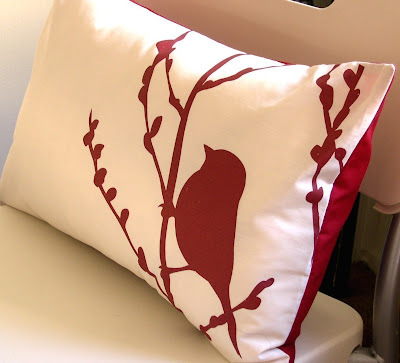 The red would pick up the red in the drapes and continue the bird theme. Love it when people are honest! So…shams aren’t really working with the white quilt. I know this, but I love them and I WANT them to work. Bird plates would work by themselves but not with my current set-up. I love my shams, so I’m going to keep playing around with them. Big empty wall will stay as-is until I figure out what I’m doing. Okay, I’ll be the oddball here… You know I LOVE to decorate too. 🙂 I think the plates above the bed would look really good… love the china white against the cranberry in them. But not both the shams and the plates, that would be too much bird. Maybe go with the plates and not the shams until fall… they’re really cute but a bit dark. Just my thoughts… take them or leave them. People don’t feel like using this as a comment forum anymore and prefer to blab to me on facebook. That’s fine. The consensus is to lose the birds. Use the plates to eat on. Or Dad, as you suggested take up the Chinese artform of plate spinning. Okay people, I can take a hint. It’s just not working. Plates will stay off the walls and in the pantry. You continue to amaze me! Thanks for making our home a great place to come home to.